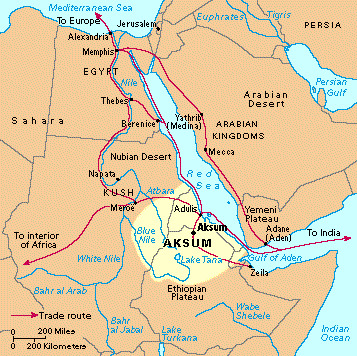 The names of the moon god in Arabia were Wadd, `Amm, Sin, Il Mukah, Hubal and Allah. Muhammad grew up worshipping many pagan gods in the Kabah including the moon, either called Hubal and Allah. After his conversion to monotheism, through the influence of Christians, Muhammad stopped worshiping the moon. The same is true for all Muslims since, down to the present day. However, the crescent moon is the universal symbol of Islam. Muslims will argue that there is no archeological evidence for the crescent moon symbol being used in Islam for the first few centuries after Muhammad. Yet Muslims also claim that Koran in its completed form existed in the time of Muhammad, yet there is no archeological evidence for this claim either. What we can be sure of, is the moon worship was more prevalent in Arabia than any other part of the world and that the symbol of the crescent moon has been used by the Arab religions as far back as the time of Abraham. It is a falsification of history to think there is no connection with the history of the crescent moon symbol of pagan moon god worship and Islam. The fact remains that most Arab/Muslim countries today still use the crescent moon symbol on their flags and atop of their mosques. The connection is so powerful that only the blind would reject any connection. The worship of the Moon god " Sîn" was widespread and common during the time of Abraham. Contrary to Muslim claims, Abraham was asked to leave Ur of the Chaldees where the moon god Sîn was worshipped and migrate to Canaan and worship Jehovah. The Ur of Chaldees is in the region of Babylon. The Mesopotamian Ziggurat: Temple of the moon God 2100 BC. The tower of Babal in Gen 10 may in fact have been a Ziggurat. The ziggurat of Ur. , and the of the moon god Sîn who is seen being carried in procession to the temple called the "Hill of Heaven". Above is actual drawing at the British Museum in London. Nanna was worshipped in the ziggurat of Ur. There was also a smaller temple for Ningal the moon goddess. Nanna was worshipped both by a High Priestes and priests. 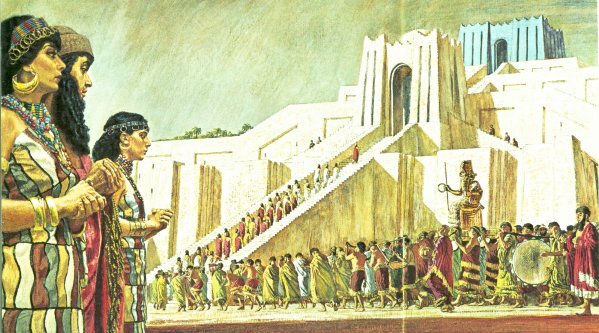 Great Kings throughout history from Sargon 2600 BC to Nabonidus 550 BC had their daughters officiate as high-priestess of Nanna at Ur. The tradition begins with the first dynasties of Ur around 3400 BC and continued through to the fall of Ur around the time of Nabonidus, a period of some 3000 years. As we shall see this tradition continued for another 1700 years at Harran and still underlies the Islam of today. "The Sumerians, in the first literate civilization, left thousands of clay tablets describing their religious beliefs. As demonstrated by Sjöberg and Hall, the ancient Sumerians worshipped a moon-god who was called by many different names. The most popular names were Nanna, Suen, and Asimbabbar" (Mark Hall, A Study of the Sumerian Moon-god, Sin, PhD., 1985, University of Pennsylvania). The status of Sin was so great that from 1900 BC to 900 BC his name is witness to the forging of international treaties as the guarantor of the word of kings. The temple was resotred by Shalmanester of Assyria in the 9th century BC, and again by Asshurbanipal. About550 BC, Nabonidus the last king of Babylon, who originated from Harran, rebuilt the temple of the Moon God, directed by a dream. His mother was high priestess at Harran and his daughter at Ur. Ironically his devotion to the Moon God caused a rfit between him and his people and contributed to his defeat by the Persians. The worship of the Moon God at Harran evolved with the centuries. It included E-hul-hul, the Temple of Rejoicing, and a set of temples of distinctive shape and colour dedicated to each of the seven planets as emissaries of the cosmic deity. Many of the descriptions of Harran through Christian and Moslem eyes include exaggerated tales of sacrifice which are probably not factual. It was said by one writer that they sacrificed a different character or type of human to each planet. A garlanded black bull was however sacrificed in public ceremony, as the bull was at Ur, and Moslem sources refer to seasonal weeping for Ta'uz at Harran, and up to the 10th century among bedouin in the desert. "His symbol was the crescent moon. 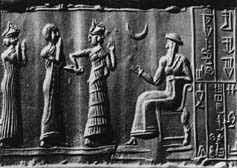 Given the amount of artifacts concerning the worship of this moon-god, it is clear that this was the dominant religion in Sumeria. The cult of the moon-god was the most popular religion throughout ancient Mesopotamia. The Assyrians, Babylonians, and Arkkadians took the word Suen and transformed it into the word Sîn as their favourite name for this deity." (Austin Potts, The Hymns and Prayers to the Moon-god, Sin, PhD., 1971, Dropsie College, p.2). In the Ugaritic texts, the moon-god was sometimes called Kusuh. Ur of the Chaldees was so devoted to the moon-god that it was sometimes called Nannar in tablets from that time period. A temple of the moon-god was excavated in Ur by Sir Leonard Woolley. He dug up many examples of moon-worship that are now displayed in the British Museum. Harran was likewise noted for its devotion to the moon-god. is shown to the right. Note the presence of the crescent moon on the Babylonian moon-god. In the 1950's a major temple to the moon-god was excavated at Hazor in Palestine. Two idols of the moon-god were found. Each was a statue of a man sitting upon a throne with a crescent moon carved into his chest (below left). The accompanying inscriptions make it clear that these were idols of the moon-god (below right). The worship tablet found at the same sight shows arms outstretched towards the Moon-god here represented by the full moon within the crescent moon. Several smaller statues were also found which were identified by their inscriptions as the daughters of the moon-god. Nabonidus the last King of Babylon, (555-539 BC), built Tayma, Arabia, as a centre of moon-god worship. "South Arabia's stellar religion has always been dominated by the Moon-god in various variations" (Berta Segall, The Iconography of Cosmic Kingship, the Art Bulletin, vol.xxxviii, 1956, p.77). In 1944, G. Caton Thompson revealed in her book, The Tombs and Moon Temple of Hureidah, that she had uncovered a temple of the moon-god in southern Arabia. The symbols of the crescent moon and no less than 21 inscriptions with the name Sîn were found in this temple. Ray Cleveland, An Ancient South Arabian Necropolis, Baltimore, John Hopkins University Press, 1965; Nelson Gleuck, Deities and Dolphins, New York, Farrar, Strauss and Giroux, 1965). This MAY be the moon god but it is not certain check the references.